Private equity investing can be rewarding, but an investor needs to be patient. Priyadarshini Maji finds out more. In the past few years, there have been many news items about big private equity players such as Prem Watsa's Fairfax, Blackstone, Warburg Pincus and others exiting Indian businesses with fabulous returns of 10x (times) or more in a few years. 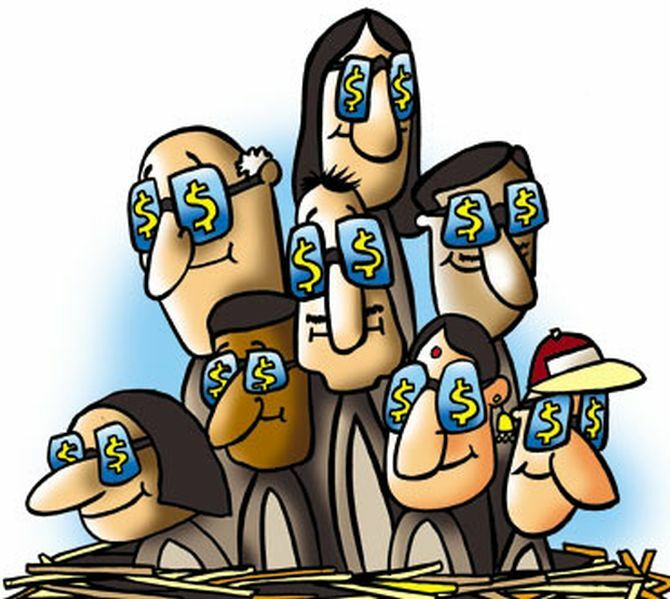 And many high networth individuals feel left out because they are stuck with the normal 10 to 20 per cent annual returns from their debt, equity, and many times, property investments. There is good news for them. They can participate in the private equities for as little as Rs 10 million (Rs 1 crore), according to the Securities and Exchange Board of India's guidelines. Private investment is a good investment in the hands of an investor who understands the nuances such as illiquidity and failure rate that come along. Investing in private equity can be done, either directly or through funds. First-time investors should take the alternative investment fund (AIF) route. AIFs are a class of pooled-in vehicles for investing in real estate, private equity and hedge funds. Currently, over 250 such funds are registered with Sebi. Typically, AIF units are neither listed nor traded in most cases. So, there is little liquidity. And that means that the money invested is for the life of the fund or till the fund exits its investments. "First-time investors should go through AIFs as these investments are managed by professionals and also helps in diversifying their holding across multiple investments. Seasoned investors can look at individual investment opportunities," says Pranab Uniyal, Director, and Head of Products, Ambit Private Wealth. Several venture capital funds, angel platforms and aggregators allow companies in which they have invested to pitch for capital directly from investors. Investors can participate directly and buy shares of such companies as private investments. These are private and one-on-one transactions, and may not have limitations on minimum amount and tenure. However, such investments are riskier. Investors who do not want to allocate as much as Rs 10 million can take the Portfolio Management Services (PMS) route to investing in private equities. A minimum upfront investment of Rs 2.5 million (Rs 25 lakh) in PMS is required. Wealth managers and asset managers run Sebi-approved PMS portfolios that invest in private equity. An investor can open an account with a PMS manager handling such private equity investments and invest money towards sectors that appeal to them. "It is not a pooling structure, and each investor receives distinct securities, which can be sold and liquidated by the PMS manager whenever an exit happens," says Amit Goenka, MD and CEO, Nisus Finance Services. Industry experts say that most private equity funds report portfolio returns ranging between 22 and 24 per cent annually which is higher than absolute returns in other asset classes. Some have even made multi-bagger returns, taking home 10 times their capital in 5 to 8 years. "At present, technology companies, along with financial and consumer-based companies, are being favoured by HNIs to park their money," says Sumit Pachisia, Head of Strategic Solutions, Sanctum Wealth Advisors. However, any new investor should be well-equipped with a sizeable investible surplus, high-risk appetite, ability to hold on to investments for a more extended period, and understanding of financial concepts. Direct investors should opt for sectors that they understand. Ultimately, your private equity investments should not be more than five-10 per cent of your portfolio. Before investing, an investor should also choose their private equity fund manager cautiously. Things like their past track records, the strategy used to invest and exit and the ability to write-off investments, should be studied. Private equity is high on the risk-return payoff, but investments should be made under professional guidance. "Since the investments are mostly at an early stage, it becomes uncertain how the company will fare in the future. Also, unlike the highly regulated listed stocks, there can be pitfalls in the financial statements of a private company which requires a professional eye to ascertain," says Uniyal. Along with the higher risks, this asset class also offers higher returns than the listed stocks. These assets do not provide instant liquidity, unlike listed stocks where you can liquidate your assets anytime you require. Private equity funds do not offer redemption and come with no specific lock-in period. Investors can get their money back, either when the company gets listed or can sell their stake to another investor or when the fund exits the company. But mostly it is difficult to get such an investor to sell the units, or the sale happens at a discounted price than the current net asset value. Normally, private equity funds carry a tenor of 6-10 years. In this time, they exit from all their investments. "Direct investors should choose companies which are mature and are close to initial public offers," adds Uniyal. Taxation of private equity investments isn't different from investments routes. For listed stocks, a period of holding greater than 12 months qualify as long-term capital gains (LTCG), or else it is considered as short-term capital gains (STCG). In case of unlisted stocks (private equity), the period is two years. Listed shares are taxed at 15 per cent for STCG and 10 per cent for LTCG. Unlisted stocks get taxed at 20 per cent LTCG with indexation (more than 24 months) and as per income tax slab rate for investments lesser than 24 months.